Last month, we wrote about the current and future benefits of cloud software technology on operations and IT as perceived by today’s manufacturers, based on the results of our 2014-2014 Manufacturing Metrics that Matter survey, conducted jointly with MESA International. Though there’s a multitude of ways, many big but some small, that manufacturers feel cloud will benefit them in the coming years, we narrowed it down to the four most immediate and relevant that manufacturers are experiencing and reporting about the cloud. But cloud is just one of the bigger tech trends exciting the manufacturing world. Another that is causing waves and innovative ways of doing things today with Manufacturing Operations Management (MOM) software is mobile technology. Though still accelerating in use within the MOM space, virtually every MOM solution provider offers some form of mobile application, so it's at a higher level of adoption and maturity than cloud. As we’ve spoken about, awareness and adoption rates are rising among manufacturers as well. So what are the current attitudes on mobile capabilities? In this post, we’ll explore below four ways mobile capabilities are helping manufacturers transform their operations and IT landscapes today, and how manufacturing professionals anticipate it furthering their success in the future. Asked about the biggest impacts of mobile technology, the top response was in enabling plant supervisors to leverage all information to do their jobs on mobile devices, at 54% of responses. Manufacturers are seeing a future where plant walls and fences are irrelevant in knowing and executing on the current operational reality. This concept has broad implications for manufacturers at large in increasing efficiency, operational flexibility, acquiring and leveraging the right talent, and others. The next two most selected answers for this survey question involved similar answers—identifying specific roles and their potential change in operational capacity—maintenance personnel having all relevant information on mobile devices, and executive management having real-time information on mobile devices. These options garnered a 47% and 44% response rate, respectively. Manufacturers believe that mobile technologies will be one of the key enablers of making the final push from vastly reduced shop-floor paper to a one devoid of physical print-outs. While this may be a ways off, it is undoubted that mobile will certainly play an important role, as constantly updated mobile read outs and integrated workflow inputs are made capable from devices that are in each person’s pocket, this will be a main impetus to making all paper redundant. This response drew a 35% response from survey takers. An equal number of respondents—22%—believe that mobile technologies will be used as a collaboration tool with both customer and supplier networks. This would likely be through interactive portals accessible through hand-held mobile devices. When compared to cloud capabilities, we see mobile as being more mature in development and usage so far in the marketplace. Correspondingly, manufacturer attitudes toward the benefits of advantages of mobile are better formed to date. As time moves forward we will see further advancements in both and integration between the two (e.g. 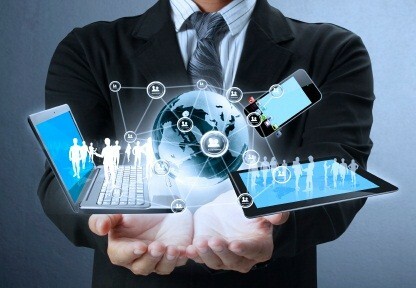 mobile deliver of cloud based applications), along with other trends such as big data and the Internet of Things. For more information about each of these technology trends, manufacturers’ attitudes, and the intersection of today’s most relevant manufacturing and business KPIs, be sure to view the 2013-2014 Manufacturing Metrics that Matter eBook, below.